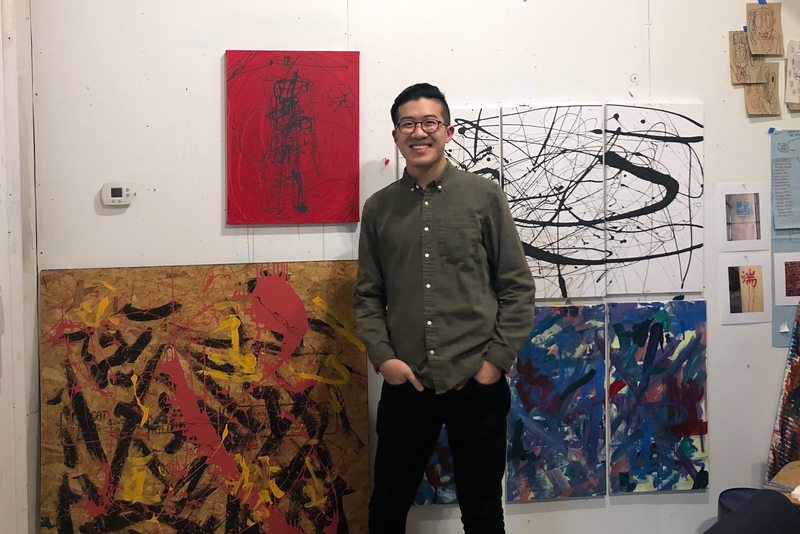 Duanduan Hsieh '19 poses with some of his works-in-progress in his Goodyear studio. Duanduan Hsieh ’19 (studio art) is an admissions tour guide, intern and student interviewer and a Trout Gallery student-advisor who exhibited artwork as part of a group exhibition at the Museum of Contemporary Art Antwerp (Belgium) in 2017 and studied in two of the world’s foremost art cities last summer, as an apprentice to an NYC conceptual artist, and last fall, as a study-abroad student in Rome. Below, he discusses those unparalleled learning experiences, including his art-fueled research at the New York Public Library, as well as his current work combining what he’s learning in social-science classes to investigate the erasure of Asian-American history in the U.S. Along with fellow studio-art majors in the class of 2019, he’ll exhibit his latest work in The Trout Gallery, as part of a professional-quality senior capstone exhibition. He's also hoping to participate in a Futures Studies conference/exhibition in Taiwan this coming May. Teaneck, New Jersey and Taipei, Taiwan. Art & art history (studio arts concentration). Asian and Asian-American Collective, Liberty Cap Society (tour guides), Office of Admissions (events intern and student interviewer), Art & Art History Department Committee and Trout Gallery Advisory Committee. 2017 and 2018 Summer Internship Grants. Please Look After Mom by Kyung-Sook Shin. I wanted to obtain my higher education in a community that celebrated global education, inclusivity of cultures, and having an emphasis on interdisciplinary studies. After visiting campus, I knew that Dickinson was right fit for me. Portabella mushrooms from the KOVE. While taking my first studio arts course at Dickinson, I realized that I could combine my passion for sociology, anthropology and history through visual expressions. This realization created a strong desire in me to make artwork that analyzes contemporary U.S. and global issues. Currently, my work investigates the erasure of Asian-American history in the U.S. and questioning ideas of belonging, place and identity. Exhibiting my artwork in Belgium at the Museum of Contemporary Art Antwerp in 2017. The piece I exhibited is a series called Advertisements From the Future (2017), and it was commissioned by a futurist, Professor Mei-Mei Song of Tamkang University (Taiwan). It consisted of four components, each touching upon a possible future that our society should think differently about. It was exhibited at the A Temporary Futures Institute exhibition in the Museum of Modern Art (Antwerp, Belgium) from April 2017 to September 2017. Advertisements from the Future (2017) by Duanduan Hsieh '18 was shown at the A Temporary Futures Institute exhibition in the Museum of Modern Art (Antwerp, Belgium) for six months in fall and summer 2017. All of this began in Romania in 2011, when I built a connection with a futurist, Maya Van Leemput. I reached out to her about doing a summer internship, and she extended an invitation for me to exhibit my artwork. Dr. Van Leemput is the head of the NGO Agence Future, which is behind the exhibition as well as the three-day international conference that I helped organize. During the conference (which was held within the exhibition), I was able to speak to participants about my artwork as well as create two videos documenting the conference (DDT Conference Impressions and Design Develop Transform at A Temporary Futures Institute). After participating in the New York Arts Practicum over the past summer, I’ve decided to move to Los Angeles to continue my pursuit of fine arts. I am hoping to build up a strong body of work to submit to exhibitions/residencies before applying for graduate schools to receive an MFA. While experiencing the change from East to West Coast, I hope to work in college admissions, as I have enjoyed my last three years interning with Dickinson’s admissions office. I studied abroad in fall 2017 in Rome, Italy. I had just spent my summer interning with Agence Future in Antwerp, Belgium, so I was extremely excited to continue my year in Europe. Being fully immersed in a foreign culture is an experience like no other. I was living next to Vatican City and rode through Rome’s public transportation to get to school every morning (not before stopping by the local bar to grab my daily “un espresso y cornetto”). The best experience I had was the Rome Sketchbook class, where we spent each class time drawing in different locations around the city. Throughout the whole semester, I felt like I was living in a museum. This past summer, I did an apprenticeship with the New York Arts Practicum and mentored with Chloë Bass, a New York-based artist and professor at Queens College. She is a conceptual artist working in performance, situation, publication and installation to address scales of intimacy. On top of working in the studio, I had multiple critiques with working artists and curators about my own art work throughout the internship. My favorite project was conducting research in the New York Public Library. I was tasked by Chloë to look for photos of multiracial families in America from the 1920s to the 2000s. Before this internship, I wasn’t familiar with research-driven art work. Being on this project opened my eyes to a vastly different type of fine arts and the importance of concept-driven work. It has had a huge influence in my latest piece, Chink Identity (2018), which was showcased in the Senior Seminar In-Progress Exhibition in the Goodyear Gallery as a portion of my thesis work. The most challenging part of the internship was creating my own body of work without the institutional support I have at Dickinson. I had to adapt my art practice to create work without having large-format printers, a shoot room and a studio—all resources that I typically have at Dickinson. Instead, I had to create work in a small New York bedroom for the critiques I had. This obstacle has provided me a clearer vision of my future career and shown me that in order to continue my career I need to find a city that can provide me with affordable space and institutions that host artistic residencies. I look forward to completing my last year at Dickinson, working hard in my studio and showing a strong body of work as my thesis in the Trout Gallery in April 2019. … prejudice does not exist as a concept.